While the peoples of Colombia developed individual artistic traditions, they shared many goldworking techniques and symbols in common with Central American artisans. The preferred metal for ornamentation was tumbaga, a gold-and-copper alloy used throughout the region to create a multitude of small figurines of birds, crabs, spiders, serpents, and anthropomorphic creatures. The figures were usually made by lost-wax casting and brightened by depletion gilding- a method in which the copper of the outermost surface was removed in an acid bath of organic materials, leaving a thin shell of pure gold. 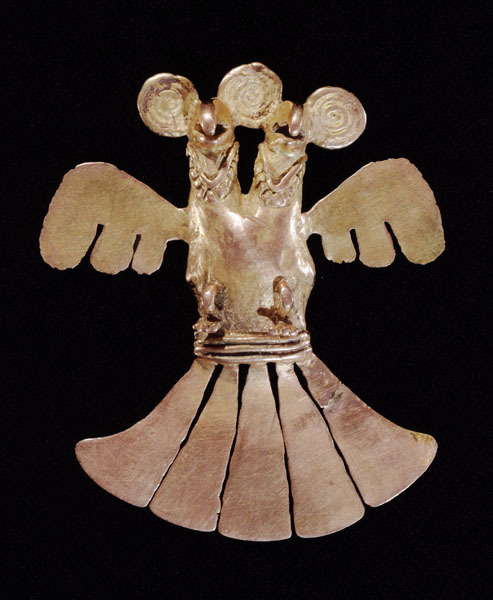 This is an example of the so-called eagle pendant, an avian creature characterized by its large beak and widespread wings and tail. False filigree forms the head tufts, and wing and tail feathers have been emphasized by hammering and stretching the metal. Found frequently in Panama, the motif and style probably originated in Colombia and later spread northward.